This glistening girl came to us with 74 other representatives of her species. They were part of a seizure in Arlington, TX of thousands of native and exotic animals bound for the pet trade. Far from the overcrowded and inhumane conditions they endured at U.S. Global Exotics, these amphibians now enjoy roomy moss-lined terrariums, large soaking bowls, and a seemingly endless supply of crickets, mealworms, and other invertebrate treats. At 1 1/2-3 inches long, these toads are named for the reddish spots that dart over their olive green to tan, squat bodies. If you live in central Texas west, you can track down serenading males luring females to any type of permanent or ephemeral water source (including cattle troughs and stock ponds) in arid to semi-arid terrain. Just listen for the high-pitched trill to find your way to the mating frenzy between April and September, especially after a heavy rain. The dusky-throated males grasp females using nuptial pads (thickened skin on their thumbs and forearms), chirping when they’ve been spurned by less than willing partners. Eventually, they find an amenable mate and eggs are laid one at a time: an unusual feat for North American toads, which generally deposit eggs in long strings. The freshly fertilized globes drift to the bottom of whatever water source serves as the natal ground, and the red spotted toads’ progeny start a race against time. Although the eggs and future tadpoles must survive attack by a barrage of waterbirds, omnivorous mammals, amphibious larvae, and aquatic invertebrates, the biggest danger that lies ahead is desiccation of their birth pool. Tadpoles burst forth from the gelatinous blobs within a few hours to a few days and complete their transformation into four-legged, tail-free adults in 6-8 weeks. Following metamorphosis, the largest impending challenge for these amphibians is persevering through the frequent dry spells that characterize their habitats. Even though these porous skinned creatures can survive losses of up to 40% of their body water, they still need special adaptations to endure in climes as far as one mile from any water source. 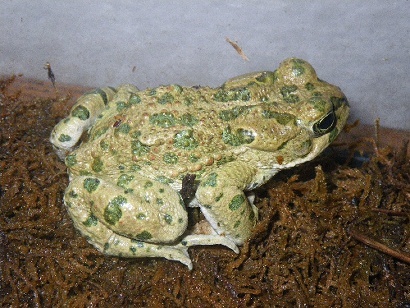 The toads sport a thin patch of skin that stretches between their abdomen and their hind limbs that allows dehydrating individuals to replenish their water stores from sodden ground and damp vegetation. Red-spotted toads also seek shelter beneath rocks, within moist plant matter, and inside subterranean burrows, bunking up with prairie dogs when the Texas temperatures soar. Adults of this species are voracious predators of the peskiest of invertebrates. So, if you are lucky enough to have these hopping hunters on your property, you have nature’s best pest control at your service for free. Make the most of this opportunity and ensure your amphibian neighbors prosper by retaining natural water sources, including vernal pools and temporary puddles, and protecting toads and their aqueous offspring from molestation by vehicles, pets, and children. In these ways you can be sure to enjoy warm spring evenings filled with the sounds of amorous red-spotted toads long into the future.